Containing more than 9,000 volumes, the Clark Hymnology Collection was acquired by Regent University in 1982 from Keith C. Clark, a retired professional Army musician. Mr. Clark's great love for hymnody and Psalmody resulted in this large collection from various dealers and individuals, American and European. 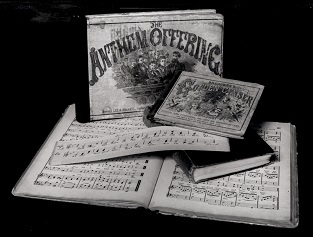 Included in the collection are thousands of hymnbooks from various American denominations and churches, as well as several well-known books on hymnody from the 17th century to the present. With a Voice of Singing is a select bibliography of master works from the collection, compiled by Jack Ralston, former music librarian and Regent archivist, in 1989. Approximately 2,100 works in the collection are listed in the Library Catalog under the title search, "Keith C Clark Hymnology Collection" (use link below). As with all works in the Special Collections & Archives, these materials are non-circulating. Researchers are welcome to contact the Special Collections Supervisor for more information.